According to a new report published by Transparency Market Research Polyester Fiber (Solid and Hollow) Market for Carpet & Rugs, Nonwoven Fabrics, Fiberfill and Other Applications – Global Industry Analysis, Size, Share, Growth, Trends and Forecast, 2013 – 2019, the global market for polyester fiber was valued at USD 62.46 billion in 2012 and is estimated to be USD 110.86 billion by 2019, growing at a CAGR of 8.6% from 2013 to 2019. In terms of volume, the demand was 37.85 million tons in 2012. A rise in construction activities is expected to be one of the primary factors driving the demand for polyester fibers, given that residential and commercial flooring solutions are dominated by the carpets and rugs sector. The growing demand for nonwoven materials and products across various industries such as manufacturing, household, electronics, hospitality and automotives is also expected to augment the demand for polyester fibers. Furthermore, a growing demand for mattresses, coupled with technological advancement, is expected to fuel the demand for hollow fibers. However, market saturation in developed regions such as Europe and North America is expected to hamper overall market growth. Moreover, certain health hazards associated with polyester and regulations governing polyester manufacturing, its usage and disposal are expected to be another vital factor adversely affecting market demand. Solid fiber was the largest product type in the polyester fiber market and accounted for over 80% of the demand in 2012. This segment is expected to be the fastest growing on account of its wide application in sectors such as manufacturing industries, automobiles, marine, aviation, apparel and healthcare. Although hollow fibers are a small segment within the market, their increasing demand in nonwoven applications, particularly in the field of medicine, is expected to establish new growth opportunities. 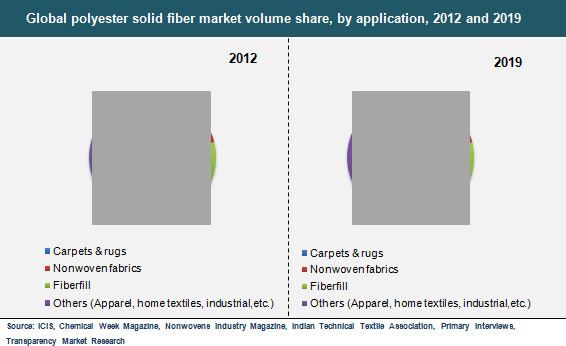 Fiberfill was the largest segment in the market in 2012, followed by nonwoven fabrics and carpets and rugs. However, polyester fibers are expected to witness the highest demand growth rate from the carpets and rugs market as carpet manufacturers are increasingly manufacturing polyester-based carpets. The demand for polyester fiber in carpets & rugs segment is expected to grow at a CAGR of 6.0% between 2013 and 2019 in terms of volume. Fiberfill is expected to be the second fastest-growing segment owing to a rising demand for insulation materials. Asia Pacific was the largest market for polyester fiber in 2012 and the trend is expected to continue over the next six years. Rapid industrialization, urbanization and increasing consumer disposable incomes are vital factors contributing to the growth of this market in the region over the next six years. Asia Pacific is expected to constitute a market share of over 85% by 2019. Furthermore, substantial GDP growth in BRIC countries over the next few years is expected to create new avenues for the growth of the polyester fibers market. The global polyester fiber market is highly fragmented in nature owing to the presence of several small to large scale manufacturers. Reliance, Sinopec, Zhejiang Hengyi, Zhejiang Tongkun and Nan-Ya are some of the leading manufacturers of the market.